Our experience has shown that many service calls and equipment breakdowns can be avoided with regular maintenance. As such, we have created a maintenance program that helps you maximize your spray booth “up time” so you can maximize your revenue. Call (888)91-BOOTH to arrange for our representative to discuss a maintenance program for your shop. The beauty of this product is the “brightness” of the white color and the fact that no water needs to be used inside the spray booth to remove it. You simply apply it and when it gets dirty, apply a fresh coat over it to give it a “refresh”. This process can be done a total of 3 times before easily peeling it off and starting over. No pressure washing is needed. Water leads to problems… such as pre-mature corrosion of the metal and hazardous waste when mixed with the over spray in the spray booth. 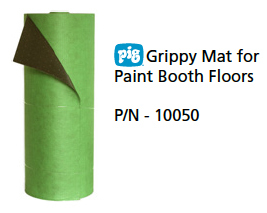 For use on paint booth floors – Cuts paint defects by 50% or more! Static decay: 0.5 sec @ 12% R.H. Surface resistance: 1011 Ohms @ 12% R.H.
We are experts in the Paint Booth industry and provide complete services for supporting your paint booth needs. From our maintenance and service programs to filter and compressor sales, you can trust John Baker Sales to deliver every time.